AgroTower is being used by home gardeners around the world. Many home gardeners have found the joy of gardening vertically. Gardeners in big cities that have only a balcony to plant love the compact way in which AgroTower can produce such volume. A single tower can easily support 12 different types of berries, fruits or herbs. 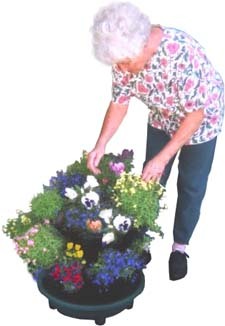 Backyard gardeners enjoy the ease of standing up for a change while gardening. Additionally, having the plants & berries elevated reduces or eliminates a number of pests & animals that tend to attack flat field crops. AgroTower can also be filled with flowers which in a matter of weeks can grow to the point where you no longer see the tower. If you stager your flower planting or select different maturing flowers the home gardener can have fresh flowers year round!